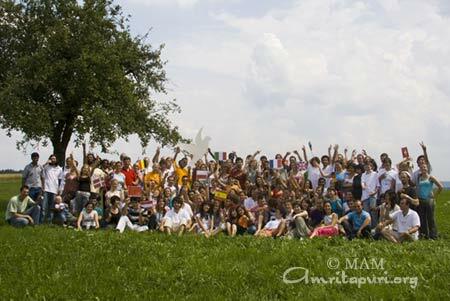 The 4th annual European Youth Exchange held at the M.A. 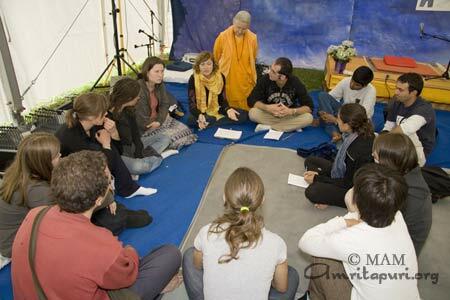 Center in Germany saw the arrival of a lot of young people from all parts of European countries to participate in a 6 day program led by Br Shubamrita and Bri. Dipamrita. For the second time, the program was co-funded and accredited by the “Youth in Action” Program of the European Commission for Education and Culture. The camp was composed of a variety of spiritual talks, workshops, bhajans and meditation, group activities and lectures on various issues relating to the youth. 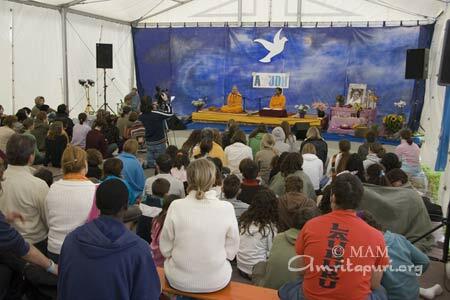 The daily programme started with Tai Chi, Yoga and Meditation classes followed by spiritual talks by either Br. Shubamrita or Bri. Dipamrita. The workshops promoting personal growth and self-development drew on various creative activities from Bhajans to Rap, Dance and Hip Hop, Acrobatics, Art-work, Tai-chi, Ayurveda and Personality Development. A Social Care workshop drew the interest of youth to promote care for the elderly by attending a care home and providing company and entertainment. The youth composed a song which was performed for those at the care home. 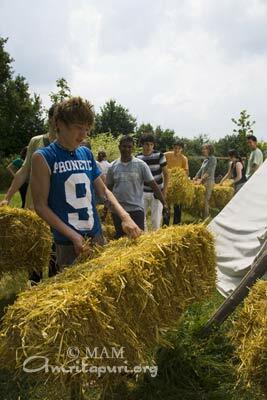 Youth teamwork led to the construction of an eco-friendly building made from straw. Guest speakers gave inspiring talks on subjects such as Eco-villages, Fair Trade, and Leadership in Youth, helping to create ripples in young minds in the hope that these ideas would spark related projects in various countries across Europe. 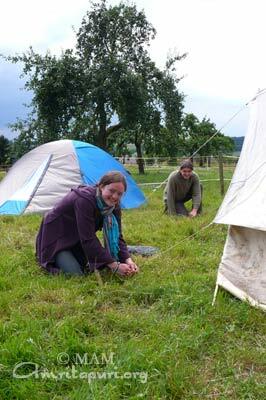 The third day of the programme involved all the young people going on a nature trek. 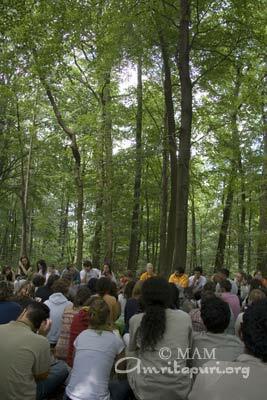 After walking in the heat of the sun the youth sat in a circle around a pond in the shade where everyone took part in a group prayer for World Peace. As the singing and chanting continued beautiful dragon flies were seen dancing around the surface of the circular pond. The trek continued till a forest clearing was reached where all the youth took part in group games followed by a picnic and a question & answer session under the trees. Daily evenings saw the presentations of what each country has been doing to promote AYUDH Europe and its values in their respective countries. The projects ranged from Green Friends activities to social care projects to waffle and cookie baking fundraisers and kirtan workshops. 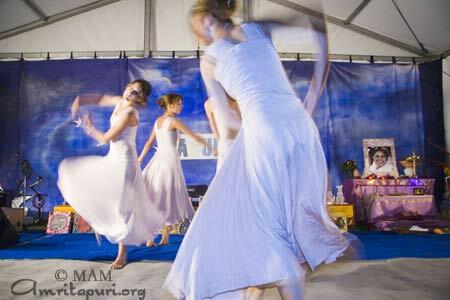 A number of countries had set up bhajan and meditation groups and there were a growing number of new projects in the making. The presentation helped to inspire especially youth form countries like Poland, Norway and Marocco, who participated in the youth exchange for the first time, to start with AYUDH projects back home. The different groups produced songs and plays based on the theme of the Youth Exchange. The last evening was a festival of youth talents with a colourful display filled with fresh energy and bundle of enthusiasm of everything the youth had learnt during the week. The local Mayor, Mr. Kredel, attended the final closing ceremony of the Youth Exchange and was welcomed with a round of applauds and cheering by the youth. He was touched by the number of youth who had assembled in this quiet village to discuss important and serious topics such as climate change, and world peace. Seeing the sincerity and dedication of so many youth from different countries, religions and social backgrounds he remarked that “world peace has still a chance.” The Mayor concluded his contribution by presenting the Youth Pass Certificate by the EU ‘Youth in Action’ Programme to all the youth participants. During one of the personal development sessions the youth had been invited to write their goals for the future on small paper doves, the symbol of AYUDH. Their pledges included to “reach my goal and become a doctor and help people in crisis all over the world” or “I will do my best to be an instrument of peace and compassion in all aspects of life, throughout my life.” Sticking the individual doves onto the backdrop of the stage, which was decorated with a huge white dove, a beautiful symbol for this youth retreat was created: that of a mother bird teaching her children how to fly high, how to reach their goals and spread peace to the world. The Youth Exchange ended with everyone singing and dancing to what seemed like a never-ending and blissful version of Mata Rani before concluding with peace prayers. 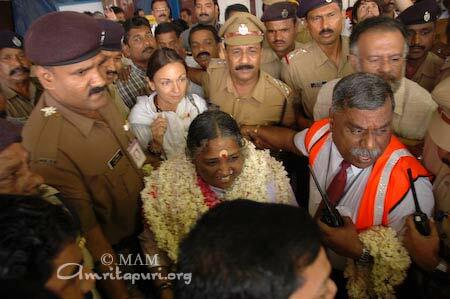 Amma arrived in Trivandrum Airport after her USA summer tour and was welcomed in Amritapuri as well by joyful devotees. 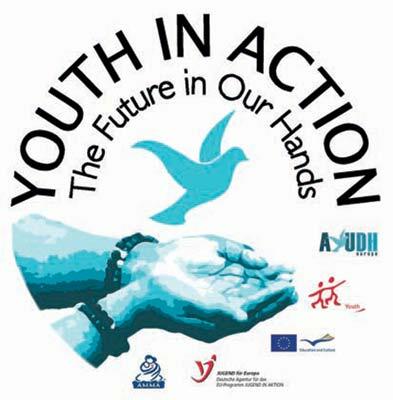 4th European Youth Exchange Supported by the Youth in Action Program of the EU organised by Amrita Yuva Dharma Dhara (AYUDH). The major handed over the “Youth Pass,” the new certificate of the European Union to acknowledge informal learning experience. 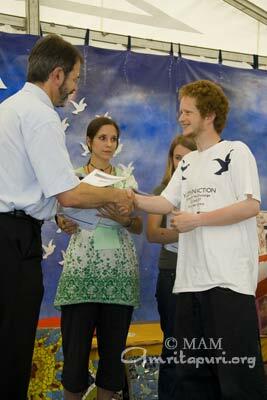 A bouquet of young people from all over Europe participated in this one week program. They reflected on the topic of the youth exchange: “The Future in Our Hands” by participating in different lectures, debates and discussions. Br. Shubamrita and Bri. 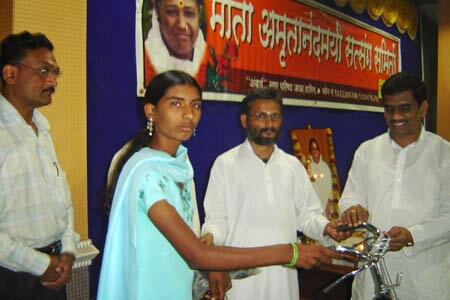 Dipamrita address the youth daily. The youth had a question and answer session with Br. Shubamrita and Bri. Dipamrita in the forest at the end of trekking. 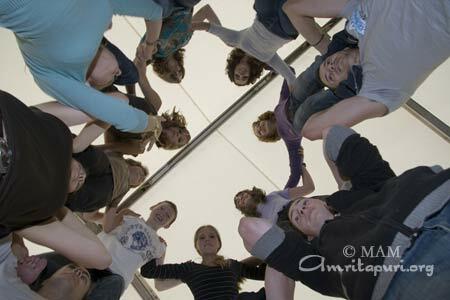 The camp had workshops in Trekking, Acrobatic performance and Dance. The youth build eco-friendly houses out of straw. Had prayer session for World Peace. Alin Poort (Amma Europe), Heike Neder (Vice-President M.A. Center Germany), Hans-Rudolf Arnold (Board Member M.A. Center Germany), Mr. Kredel, Major of Brombachtal, Br. Shubamrira Chaitanya, Bri. Dipamrita Chaitanya, Christiane Gude, Filmmaker participated at the closing ceremony. 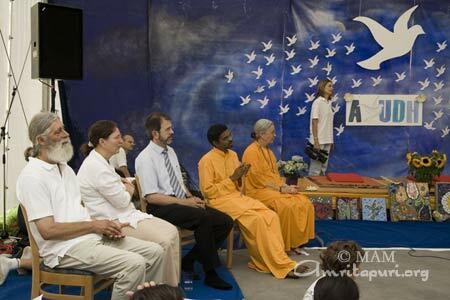 At the close of Amma’s 2008 North American Tour, Amma held a 4-day program in Toronto. The state capital of Ontario is a melting pot of many nationalities, including large Indian and Chinese populations. 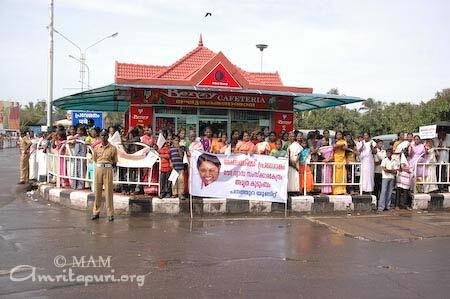 This was reflected in the diversity of people standing in line to meet Amma. The lines snaked through the corridors and several seating areas throughout the program venue, and numbered in the thousands. Mr. John Sprovieri, Regional Counselor from the city of Brampton, was also on hand to welcome Amma. 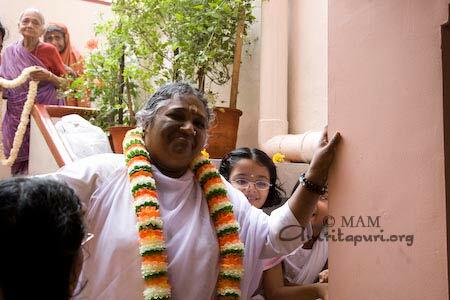 In his remarks, he said, “We are so fortunate to have people like Amma who is close to our Creator. The spirit of the Creator is within her very strongly.” He also presented an official plaque from the city of Brampton to Amma. Mr. Singh spoke in Toronto, but it was a statement that could have been made anywhere on the tour, by any one of Amma’s children. 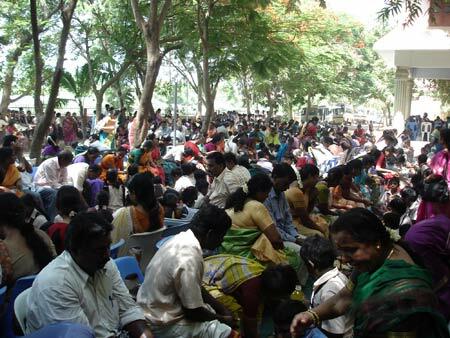 “Vasantha vat lokahitam charantah”—Like the spring season, the Mahatma travels for the good of the world. 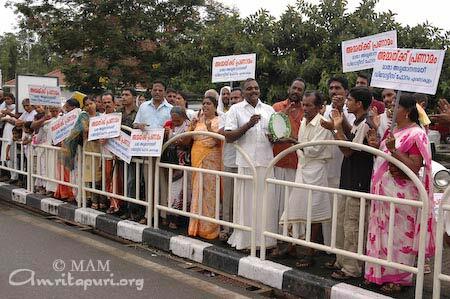 The spring season of Amma’s presence is coming to a close in North America, but it just about to dawn in Kerala. Throughout the world, Amma’s devotees and disciples offered their heartfelt worship and prayers to their beloved Satguru today. 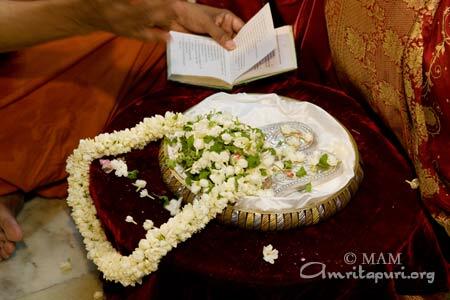 In Marlboro, Massachusetts, where Amma was concluding her 21st annual tour of the United States, Sri Guru Pada Puja was performed, as well as the chanting of Amma’s 108 Names. 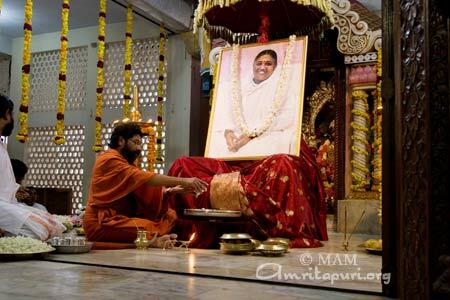 Swami Turiyamritananda performs Guru Paduka Puja. 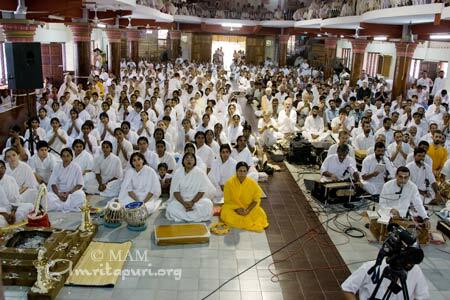 Ashramites chanted Amma’s 108 names and Veda mantras as part of Guru Purnima celebrations in Amritapuri. 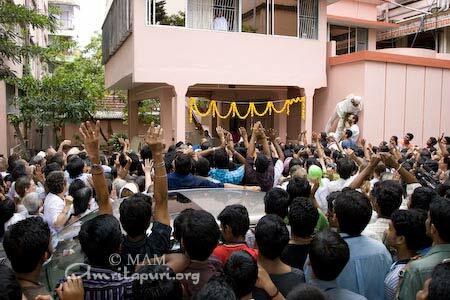 The ashram resonated with devotion to the Guru. 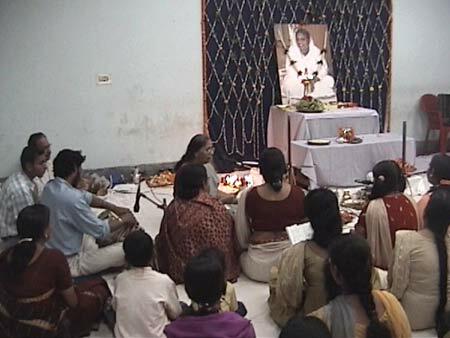 At Chennai ashram, Guru Poornima was celebrated as a full day event starting with Guru Paduka Pooja, Sahasranam Archana, Satsang, Bhajans, cultural programmes and ended at 8.15 pm with Nagara Sankrithanam. 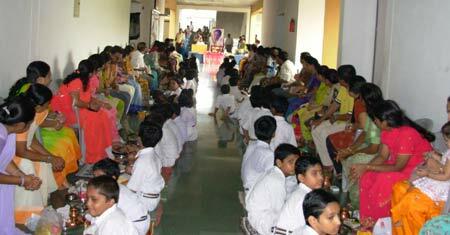 Guru Purnima was celebrated with worship of parents by the students of Amrita Vidyalayam, Chennai seeing them as their first Guru. 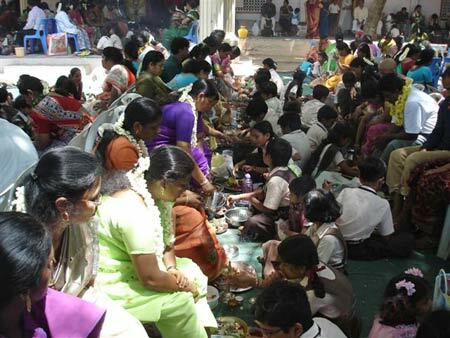 More than 700 students participated in the function. 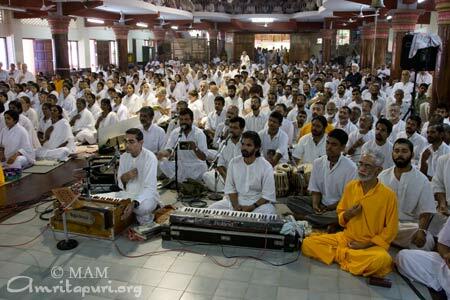 Gurupurnima was celebrated at the ashram in Hyderabad. 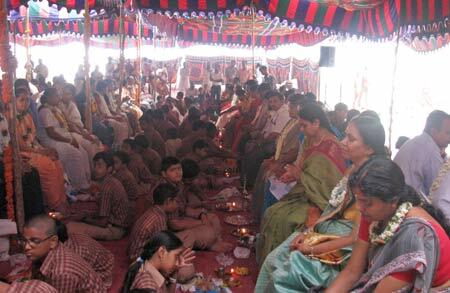 Gurupaduka puja was followed by “Samskriti Puja’ – the Amrita Vidyalayam children worshipping the parents. MAM provided a teacher with textbooks so she can better teach the tribal children who attend her anganvadi (pre-primary school). 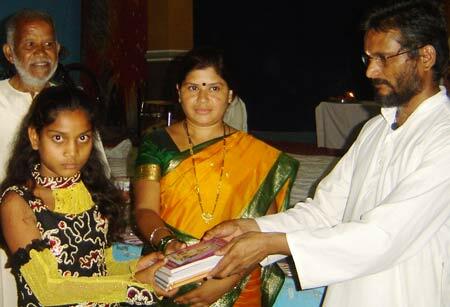 Anita, girl from an agricultural family, received new textbooks for her studies. Her father committed suicided last year. 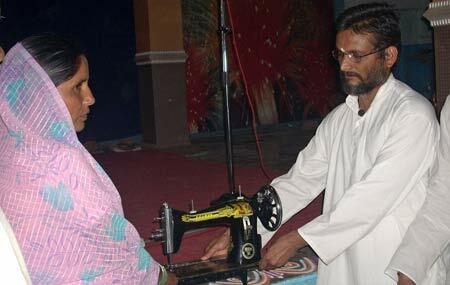 MAM provided this lady from Washim a sewing machine so that she can earn a livelihood. Her husband, a farmer, committed suicide a few years ago, leaving the burden of the family’s income on her shoulders. Seva Samiti of Ranchi organized programmes on new clothes distribution among the poor & needy children and grown ups in the villages in and around Ranchi. In the evening a Bhajan Sandhya was conducted at the Recreation Club of SAIL Satellite Township, Ranchi in connection with the Gurupurnima celebrations. 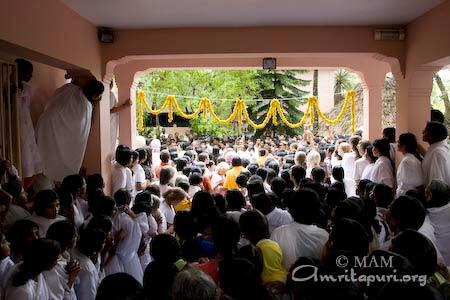 Each day you will find the brahmacharis at Amritapuri slowly walking in single file around the perimeter of the bhajan hall. Some have their eyes fixed on the ground, some let malas of rudraksha or rosewood slowly pass through their fingers, others move with their eyes half-closed, clearly focusing on something deep within. 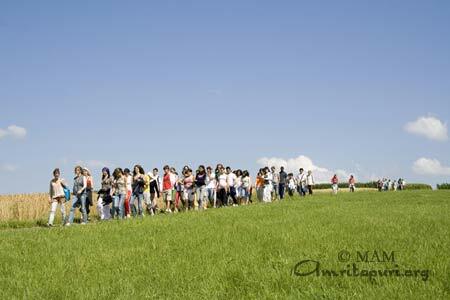 All are practicing different forms of walking meditation. 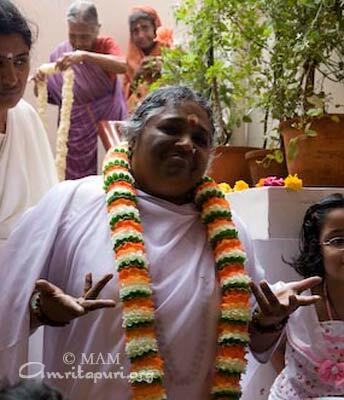 When Amma was a young girl, in order to set an example for others to follow, She would say Her mantra, “Amma’ Amma’ Amma’,” with each step—even going as far as to take a step backward if She ever forgot. It is also believed that Sri Buddha taught his disciples a form of walking meditation, as in his discourse “Satipatthana Sutta,” he said, “A monk while walking knows “I am walking. '” The walking meditation associated with Lord Buddha involves focusing on the movement of one’s own body to the exclusion of all else, to fully abide in one’s walking. In essence, both meditations are the same. 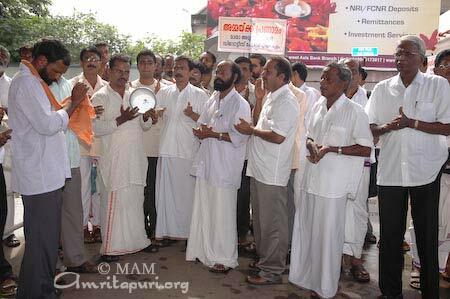 They are methods of bringing the one-pointedness of meditation into our daily life, methods of cultivating what Amma calls ” bodha” (awareness) and the Buddha called “sati” (mindfulness). After all, we mustn’t limit our spiritual practices to the meditation hall. 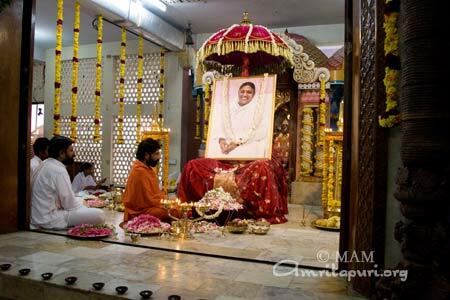 The point of spiritual life is to come to abide in the sahaja samadhi of Amma —where one perceives God or Brahman pervading everything within and without, eyes opened or closed. 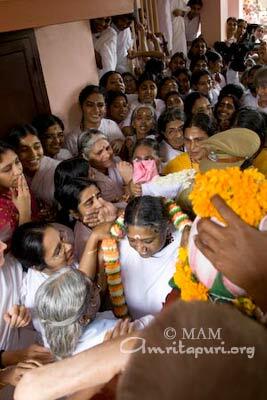 In the beginning it takes a lot of effort to chant the mantra with each step or breath, as Amma did. 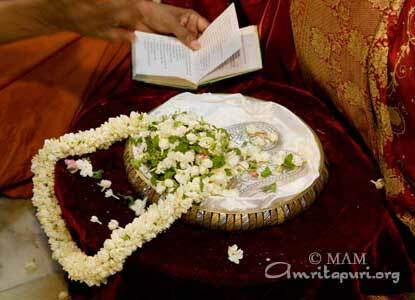 But if this practice is maintained, eventually the mantra will come on its own accord, without any effort on our part. 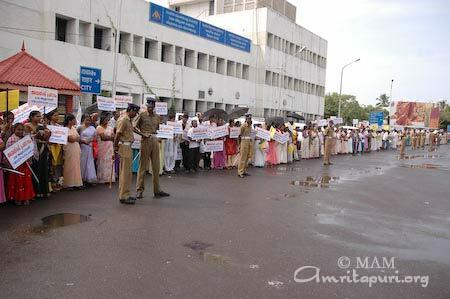 Amma says the mantra will continue to be chanted, even when we are sleeping. One way to attain this is through associating the mantra with a physical action that we do all the time such as walking or breathing. Focusing our mind on our physical movements can revolutionise the way we go about our day. Upon practicing this type of meditation many realise a heretofore unnoticed beauty in his or her movements. The experience of walking can become like that of a graceful dance the role of the sole on the ground, the shift in weight from one leg to another. If one concentrates, their entire manner of walking will be transformed perfected, literally from foot to head. With both of these forms of walking meditation, our thoughts become less and less, and a profound peace ensues. The mind now silenced, we can begin to take in the world through which we are moving with a deep awareness — the trees, the buildings, the clouds, the flowers in the garden, the bees collecting nectar’. We can begin to perceive things about these objects that we’ve never before noticed their uniqueness, their beauty, the mystic perfection with which they’ve been woven and relate to one another. A new world is thus opened up to us. Going even deeper, we can come to experience the underlying unity of all the objects of this creation the pure existence, or ” is-ness,” that is their substratum. The more awareness we are able to bring to our working day, the deeper our awareness will be when we sit for meditation. This is because we are no longer spending what we’ve worked so hard to earn when we were seated with our eyes closed. In fact, it is just the opposite we are continuing to ” earn” it with eyes open. We walk all the time. It is something we take for granted. But try “practicing” walking, and see where it leads you. Presented to Her Holiness Sri Mata Amritanandamayi Devi: In recognition of her tireless global humanitarian work, rehabilitation of tsunami victims in South East Asia, raising one-million dollars towards President Clinton’s Hurricane Katrina relief fund, and blessing the Washington Metropolitan Region through her visits each summer over the last 11 years. Amma was welcomed to New York by Ramu Damodaran, chief of the Civil Society Service of the United Nations Department of Public Information, and Anika Rahman, the President of Americans for the United Nations Fund for Population Activities (UNFPA). 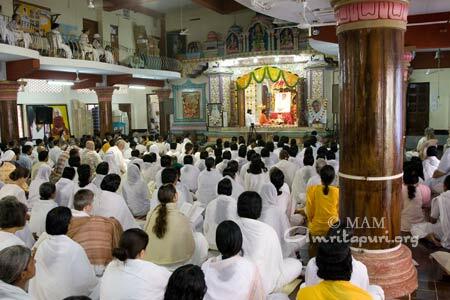 After garlanding Amma, both dignitaries addressed the capacity crowd that had gathered at the Manhattan Center for Amma’s satsang, bhajans and darshan. 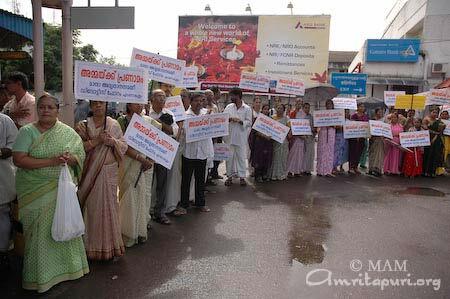 Damodaran went on to say that how he has always admired the work of Amma and the Mata Amritanandamayi Math, comparing the Math’s peace-promoting human-rights work with that of the United Nations itself. Amma was welcomed to the Chicago area by Dr. Sharon Hahs, the President of Northeastern Illinois University. Dr. Hahs and Northeastern faculty and students presented Amma with a series of sacred objects, culminating with Dr. Hahs reverently placing a blue wool blanket around Amma’s shoulders—a Native American tradition reserved for guests of the highest honour. “I bring greetings and blessings from Northeastern Illinois University,” Dr. Hahs said. Among the sacred objects presented to Amma were World Peace Candles lit from eternal flames, water drawn from a confluence of sacred rivers and lakes, a replica of a Peace Pole housed on the Northeastern’s campus, coals used in a Native American fire ceremony and letters written by children to world leaders. 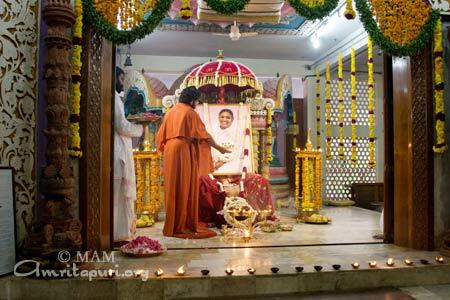 Amma is giving satang, darshan and leading meditation and bhajans in Lombard on July 5th and 6th.